DECEMBER 8, 2018, Women’s Club of Milton welcomes guests to their Annual Holiday House Tour The Women’s Club of Milton presents a unique lineup of eight homes and three public venues festively decorated for the 2018 Annual Milton Holiday House Tour. Featured this year is a Cape Cod style home with a personal airplane hangar on the property, complete with airplanes decorated for Christmas. 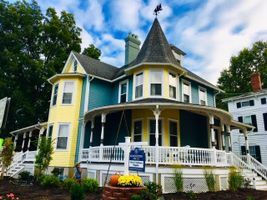 Tour guests will also enjoy the mid-20th Century Milton Post Office recently repurposed into an artist’s home and studio, and a classic 1901 renovated Queen Anne style home. Other venues of note include Milton’s newest Bed and Breakfast, which has revitalized one of Sussex County’s oldest homesteads, the Winter Art Show at The Milton Arts Guild, and the unique historic home of Libby Zando and Bob Zando Blayney, strong cultural and business advocates of Milton for over 30 years. This year’s house tour will be held on Saturday, December 8th, beginning at 2:30 p.m. and ending at 6:30 p.m. (rain, shine or snow) and will share the day with Milton’s Annual Holly Festival (9:00 a.m. - 3:00 p.m. at the Milton Fire Hall). Tickets are on sale now in Milton at The Mercantile, Salon Milton, and The Suburban Farmhouse, and at Lewes Gourmet in Lewes. Pre-tour tickets are $20.00, or same-day tickets can be purchased at The Mercantile, the WCOM homemade bakery sale booth in the Milton Fire Hall, and the Milton Historical Society for $25.00. Call 302-329-9738 to reserve a ticket; Tickets/Tour books will be held for pick up at the Milton Historical Society until 2:00pm on the day of the event. For further information call 302-354-8470.